Tessa Gray should be happy — aren’t all brides happy? Yet as she prepares for her wedding to Jem Carstairs, a net of shadows begins to tighten around the Shadowhunters of the London Institute. 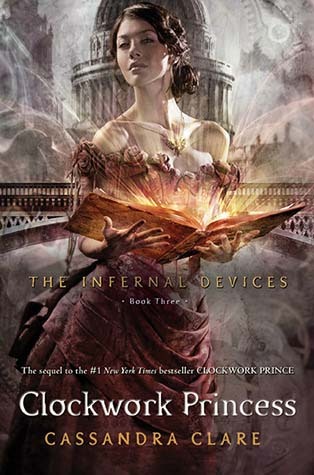 A new demon appears, one linked by blood and secrecy to the Magister, the man who plans to use his army of pitiless automatons, the Infernal Devices, to destroy the Shadowhunters. He needs only one last item to complete his plan of destruction: he needs Tessa. Tessa knows Axel Mortmain, the Magister, is coming for her, but not where or when he will strike. Charlotte Branwell, the head of the London Institute, is desperate to find Mortmain first. And both the boys who lay equal claim to Tessa’s heart, Will and Jem, will do anything to save her. For though Tessa and Jem are now engaged, and Will knows he should force himself to find someone else to care for, he is as much in love with her as ever. To buy Will time, the warlock Magnus Bane joins with Henry Branwell to create a device that could help them to defeat the Magister. As those who love Tessa work to save her, and the future of the Shadowhunters that resides with her, Tessa realises that the only person who can save her is herself—for in the discovery of her own true nature, Tessa begins to learn that she is more powerful than she ever dreamed possible. But can a single girl, even one who can command the power of angels, face down an entire army?